Last July, while writing a brief explanatory posting about Deschutes War Chief Stock Whitley (“What’s With Whitley?”), I mentioned that Thomas Lovewell staggered out of Fort Churchill, Nevada Territory, in February 1864 and boarded a stagecoach bound for Dayton, twenty miles or so to the west. Phil Thornton emailed to inquire how I knew that. He had me. I didn’t know. I was supposing. The clue that Thomas probably headed for Dayton is contained in a line at the bottom of his certificate of discharge, noting that Dayton was where the soldier wished his mail to be addressed. Wherever he was headed, he would at least make Dayton his headquarters, the place where he would drop by from time to time to check for mail that had arrived for him in care of General Delivery. Local newspapers published the names of addressees who would could find letters waiting for them at the local Post Office. There is, for instance, some indication that Thomas’s brother William lived for a time at Lawrence, Kansas. At least that’s where a letter for him waited in November 1865, its arrival advertised in the Daily Kansas Tribune. Although William is listed in the 1870 census as a resident of Leavenworth, Lawrence is also where an item in the September 3, 1870, issue of the Marysville Locomotive places him while extolling his prowess at snagging catfish. Mr. Wm. Lovewell, of Lawrence, set his hooks, on the 20th of this month, in the Kaw, and in eight hours robbed its waters of six catfish, weighing in the aggregate 549 pounds. The least one weighed 77, and the largest 117 pounds. Is William Lovewell staring from his portrait with an angler’s pride, a look of demonic fury, or is he trying to coax his facial muscles into the frozen smile needed for the long exposure time of pioneer photography? As with many frontier portraits, this one seems to be a drawing based on a photograph, so any resemblance to William Lovewell depended on the skill of the artist..
Is the subject of these news items the same William Lovewell who was Thomas Lovewell’s older brother? We suppose so. 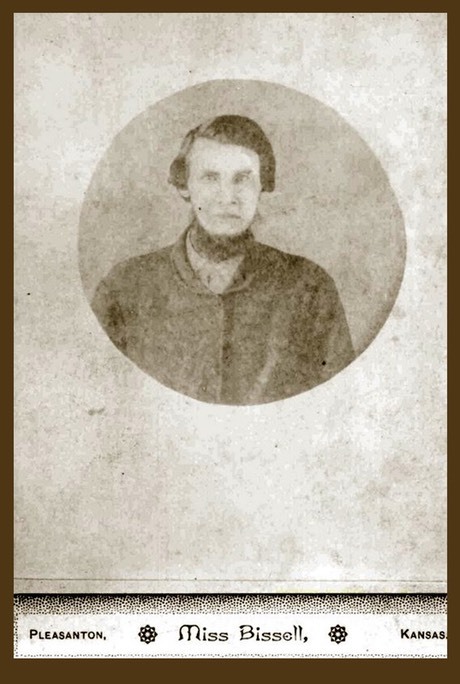 Born in Ohio in 1821 or '22, William had lived in Iowa and Missouri, joined the 5th Missouri Militia Cavalry in 1862, and at the time of his death in 1875 had a farm near Pleasanton, Kansas, thirty miles north of Fort Scott. William has been the victim of some genealogical supposition, which must have seemed solidly-grounded at one time. A few years back it was suggested that William had three wives, Charlotte Bohall and Martha Morris, who both predeceased him, and Matilda Wise who survived him. Then, a biography surfaced for a son of William Lovewell and Charlotte Bohall, reporting that the young man’s father had died at Natchez while on a business trip in 1850, and that his mother Charlotte died nine years afterward. Oops. Barring evidence to the contrary, let’s make that two wives for Thomas Lovewell’s older brother. Did Thomas actually hop a stagecoach to Dayton in February 1864? That one really is a guess. There’s no way to tell for sure, since no one kept a ticket stub, but taking the stage makes sense to me. Fort Churchill was on the route of the Overland Stage that hauled mail and passengers to the Comstock Settlements, which were crisscrossed with competing stagecoach lines. He had been cooped up in Fort Churchill for over a year, including nine months spent with the ghost of his younger brother Alfred. Would Thomas have waited until a slow military transport happened to make a trip to the settlements, or would he have strolled over to Buckland Station and caught the first westbound stage? The stagecoach was relatively fast, and with so much competition, fares were cheap. I decided to dig further into the matter, and I’m glad I did, because at the very moment I started looking, Dayton historian Laura Tennant had just posted a column for the Reno Gazette-Journal, called “Dayton and Como, 150 Years Ago.” She writes that, “A sesquicentennial ago in 1864, Dayton was a lively community on the Overland Stage route that led east, west and north, to Austin, Virginia City, Carson City and California.” The ramshackle town with a few hundred residents that had greeted Thomas Lovewell and his companions when they arrived in 1860, had blossomed in the interim. In 1865, Dayton proper had a population of 2,500. Imagine, in those days, 18 hotels and restaurants operated at the original town site. There were meat markets, bakeries, an assay office, barbershops, laundries, grocery stores, saloons, ore-processing mills and livery stables. Because travelers arrived via horseback, wagons or stagecoaches pulled by oxen, horses or mules, they needed room and board for their horses as well as themselves. Livery stables were kept busy day and night. Besides boarding animals, the owners rented horses, carriages and wagons. Hay then was $80 a ton, barley cost $10 for a 100-pound sack, and a four-mule team, with a driver, rented for $20 to $30 a day. Life was about as good as it got for a milling and mining town. Responding to my email query, Ms. Tennant added that, “In 1864 there was a Union Hotel in Dayton where the soldiers stayed for awhile. Dayton had plenty of saloons and gambling was in vogue then too.” Thomas might not have gotten to the theatre as often as I first supposed. But I still think he took the stagecoach to Dayton.